Tilt-shift miniature faking is a process in which a photograph of a life-size location or object is manipulated so that it looks like a photograph of a miniature scale model. By distorting the focus of the photo, the artist simulates the shallow depth of field normally encountered with macro lenses making the scene seem much smaller than it actually is (Wikipedia) and it is particularity suited to cityscapes. TUAW have broken form their normal Mac based news to put up a fantastic tutorial talking you through the few simple steps to create your own model city view from almost any imagery. It is also worth looking at the additional Fake Model Photography tutorial by Christopher Phin. The concept is the same but the technique is actually slightly refined and much easier to pick up. 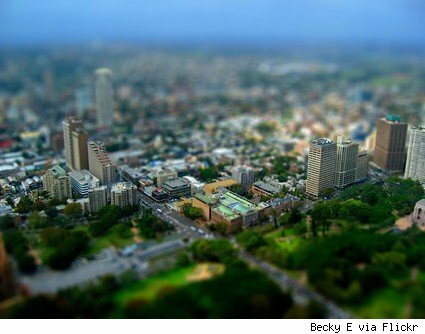 We will be featuring some examples over the coming weeks using GigaPan image capture techniques (more on that soon), if you have a model cityscape let us know..
You can see the title image of Sydney by Becky E in its full glory via Flickr. Can I be first to point out the amusing typo in the title and suggest you put the f back in shift? 🙂 Thanks for the comments – typo corrected. Becky – I’ve put a direct link to your image in the post, its a great example. I put a few of my favorites on my Places and Spaces blog. It really is amazing to see how the brain wants to believe these are models, even after it sees evidence to the contrary.